Explore the Effects and Reaction Rates of Enzymes. Enzymes are organic catalysts which control the rates of biochemical reactions in cells to aid them in maintaining all life functions. The functioning of enzymes can be observed outside of cells. This kit allows students to observe the effects of the enzyme amylase, which acts upon starch to fragment it to form dextrin. 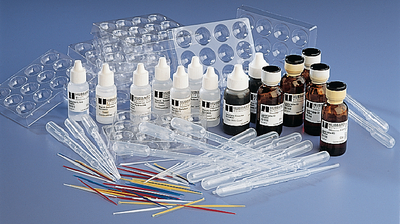 Rates of enzyme reactions are investigated by varying factors, such as enzyme concentration, temperature and pH. Ordering information: Amylase and starch solution require refrigeration.